MAC Rotary units are manufactured in several sizes, to inspect products ranging from 5mm to 500mm. 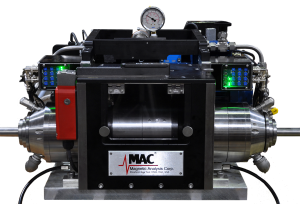 MAC’s Echomac FD series of instruments, when used in conjunction with our rotaries, provide optimum performance and make up a complete system to test your product. 100% Coverage at high throughput rates. Multiplex transducer design allows lower noise signals and up to 48 transducer elements. Unique rotary mounted transformer and pulser/receivers provide maximum sensitivity and minimum noise. Multiple transducer elements can simultaneously test in different directions such as CW, CCW, FWD, REV, as well as measure wall thickness and detect laminations. Precision test blocks and transducer holders ensure accurate positioning to detect small defects, even at high throughput speeds. MAC’s 25mm Rotary also features convenient adjustment of the transducer angles and an 8,000 RPM maximum running speed. 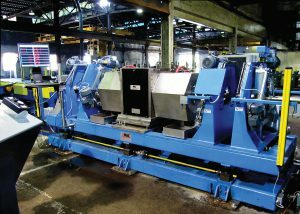 The overall length of the unit is 630mm, which allows for ease of installation in existing inspection lines. Wall thickness as thin as 0.3mm, and tubes as short as 1 meter, can be successfully tested. MAC designed water packages are also available, to ensure the required clean, temperature controlled water is utilized for your ultrasonic testing needs.